Pascal Bernier’s sculptures, paintings and photographic images cannot fail to charm the viewer. 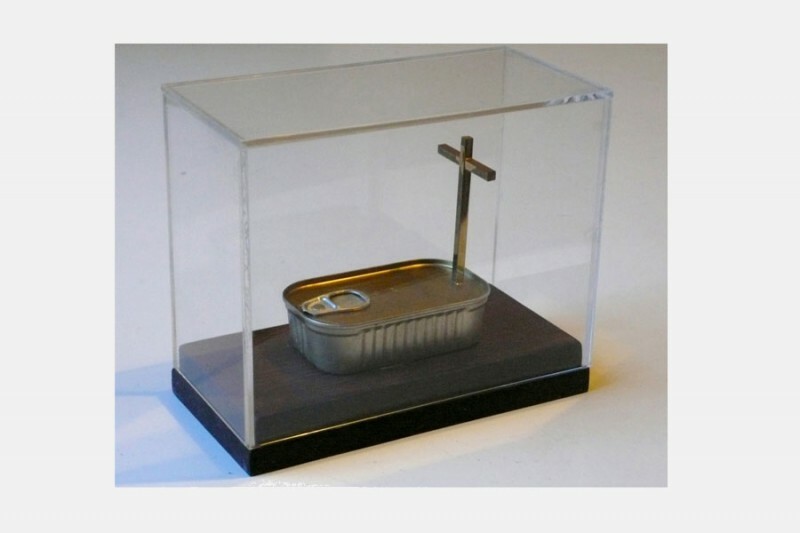 His subtle use of metaphors bring comfort where there is despair, and his enigmatic style is laden with symbols. However, the meaning of his work is not difficult to grasp. Glancing around Pascal’s studio, it is the lifelike stuffed animals that first catch the visitor’s attention. Wounds on their stomachs and heads have been bandaged – not without a certain irony, of course. His still-life work also sparks the viewer’s empathy; for example, a young deer lying prone, staring at the visitor with one eye. His other eye has been bandaged, as have the animal’s small, thin legs. This fragile beast strikes a universal chord in the viewer; compassion. The work shows the transformative effect of art; the artist seeks to heal the animal’s wounds, thereby restoring him to life. 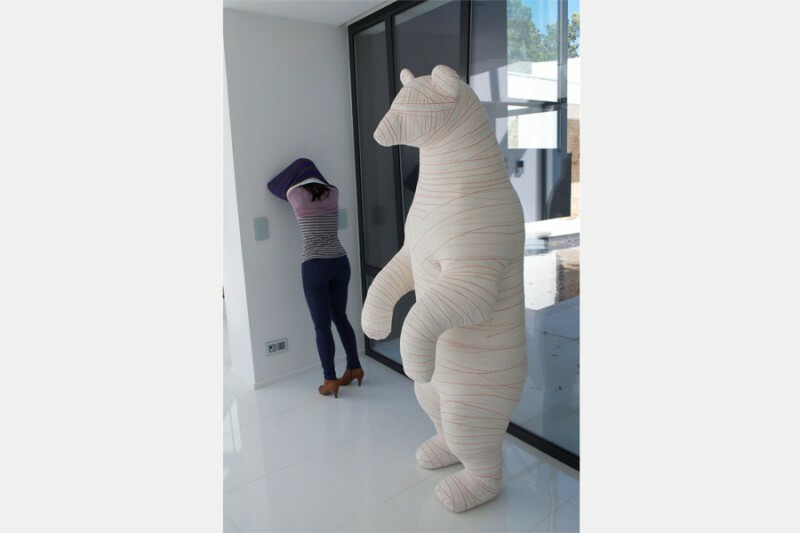 In the same series, there is also a huge, mummified bear. Bernier says: : “To me, this work is a kind of allegory in which I nurture my childhood dreams. At the same time, I was interested in the manipulation and exploitation of these emotions by the media, and by the world of politics and economics. Spontaneous emotion appears to repress thought.” Ethical and political messages may also be drawn from this work – although this was not the artist’s goal when creating it. Moreover, he asks: is it not time for us to take a more sustainable approach to the natural world? Bernier observes human behaviour with a discreet, playful sense of humour. 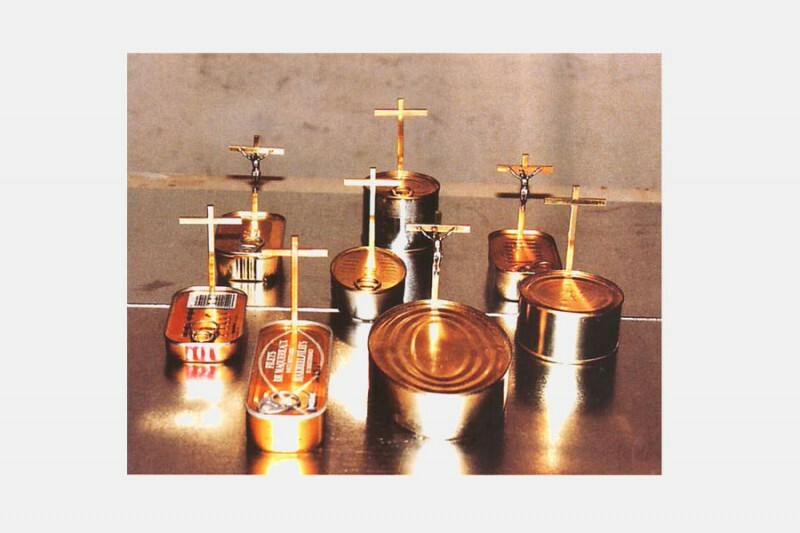 His cans of tuna flanked by crosses – which highlight the excessive industrial exploitation of nature – will already be familiar to many. At first sight, Funeral Fish seems to be a bit of fun, but it also calls our attention to a serious problem. The same can be said of Bipolar Perversion, in which a brown teddy bear is seen engaging in a romantic tryst with a white polar bear under threat from extinction. This unprecedented work is a light-hearted but painfully direct representation of the perversity of unrestrained consumption. Perhaps his most provocative work so far, however, is a video in which fragile flowers are stuck down with scotch tape, then destroyed with a hammer and sander. The plants are hopelessly vulnerable, and unable to defend themselves.